Aaaand…Christmas is HERE! – Beware the Comfort Zone! September is “officially the unofficial” start of Christmas season here in the Philippines. It begins with the first “-ber” month, not to be confused with “brr” months as those north of the equator might think, because, well, it’s never “brr” here, unless the thermometer decides to drop below about 75 degrees. I know the States have pushed their start earlier and earlier each year, I have recent memories of Costco putting out decorations in late August, but this is more than getting inventory on the sales floor in hopes of freeing up space in the stockroom and capturing some early sales. This is the start of the “Christmas Spirit”, which is usually extinguished by the beginning of December.Since there is no “Fall” season here to speak of, there is no Fall decor, which makes me sad. Last September I put up some artificial orange and red maple leaves, and our helpers said, “ooh, pretty Christmas leaves!” No. They are Fall leaves. Christmas stuff goes up in November. That’s what 35+ years of American culture drilled into my head, but with no Fall, no Black Friday to mark the start of the season, and no understanding of why we would decorate with dead grass, leaves, and perfectly edible vegetables, Christmas decor begins to creep it’s way into the malls, onto the doorsteps of houses, and well, any place it can. I hate to admit it, and maybe I’m exposing an embarrassing level of assimilation, but I am starting to like the gaudy, crazy, glitter covered decor that contrasts the traditional red/green/silver/gold decor we default to in the States. Last year the newest mall in town put up a pink, purple and blue tree for their inaugural Christmas season, and my initial reaction was, “I LOVE it!”. 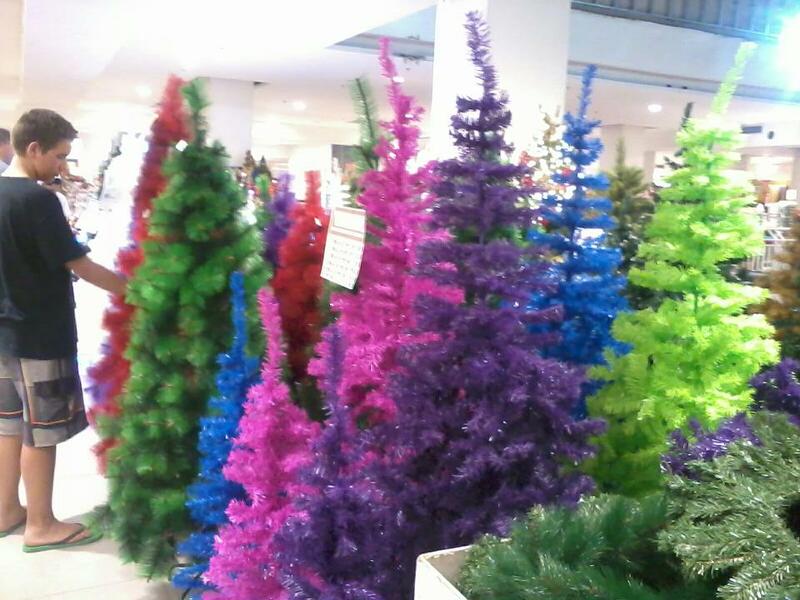 And then I realized I just got excited about a pink, purple, and blue tree…eek. The other most traditional decoration here, the star shaped lantern called a parol, shows up everywhere, in every color, from little 10 peso plastic ones that hang from a car’s rearview mirror, to the fancy light up, singing ones that can run quite steep. Last year I found some green and gold ones, perfect for bridging Fall football season and the Christmas season. This year I might even get around to hanging them up before Football season is over…go Ducks! 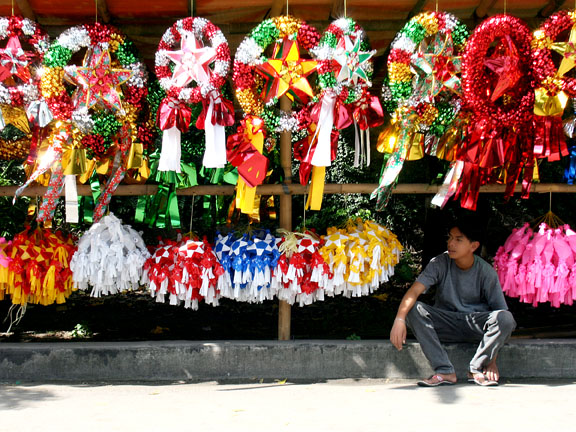 Parol stands began to appear along the sides of the roads, a decoration all their own! Don’t adjust your settings…these trees are not green! And the infamous “beetle kill” tree…I so wish I had the guts to put one of these up! 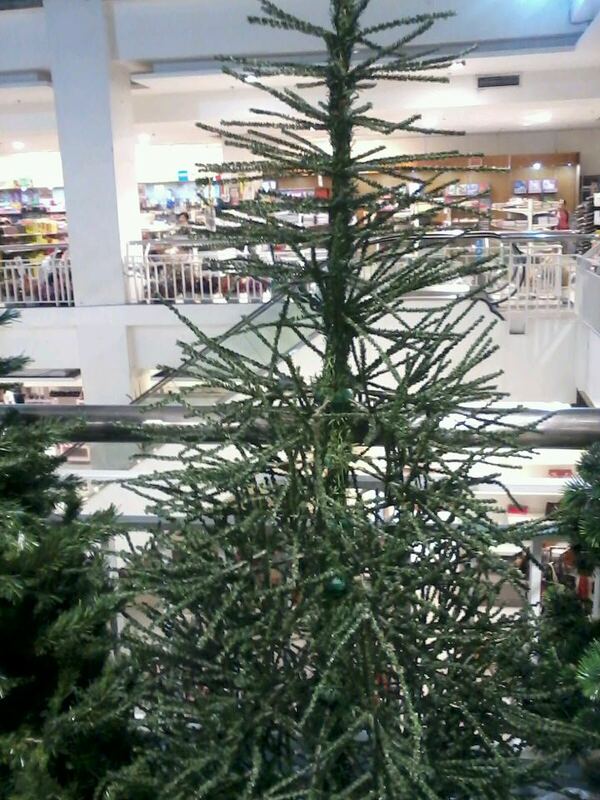 I’m sure there’s an explanation as to why someone would want a tree that looks as though it barely survived an infestation. Give me a minute or two. Speaking of singing, this country LOVES LOVES LOVES music. Not a bad thing, I love going to the grocery store, and hearing the chorus of stockboys all belting out the same 80’s power ballad along with the canned background music. Obviously, Christmas is no different. And, they take the music to the streets in the form of caroling. Oh, how sweet to have carolers, a tradition that has been long forgotten in most parts of the world. It’s done a bit different here though. About mid September, or earlier, carolers will begin showing up at your gate nearly every night. In their mind, caroling is about financial gain. We sing you a song, you pay us. The first year we were here, we arrived December 6th. Christmas is in overdrive by this point, and we had carolers every night. The first few nights it was cute, the little kids who didn’t know the words, who couldn’t sing a note in tune, aw so precious. 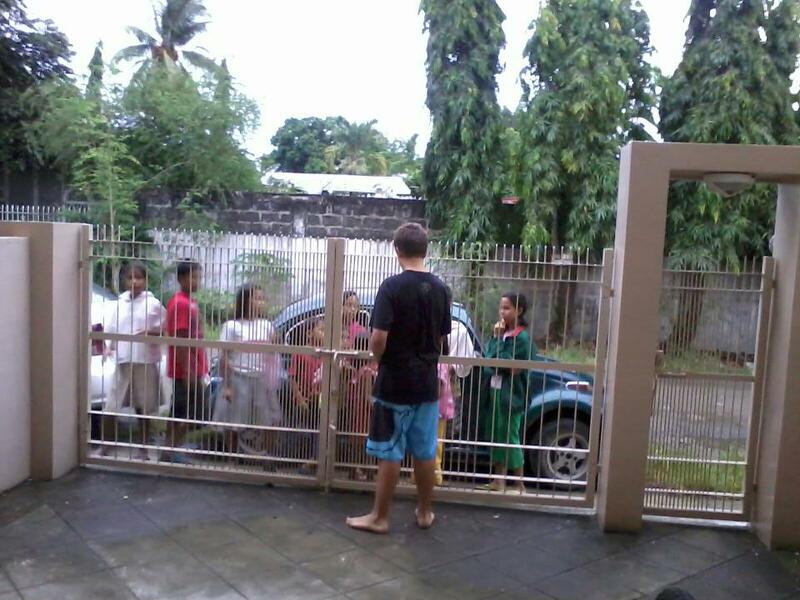 After the third night, Andrew, out of desperation for some peace and quiet, gave the group of kids at our gate 20 pesos to go away (about 50 cents), and word obviously got out that we were the place to go. So once the evening rolls around, we pull our curtains tight, dim the lights, and hide. The few days before Christmas we usually give out snacks, but think of dealing with trick or treaters for 4 months straight. Gets a bit old. But do we pull out the Christmas Karaoke on Christmas Eve? You betcha! While the emphasis on consumerism and gifts is much lower, it is the season where beggars and opportunists to come out of the woodwork, much like most other areas of the world. The security guards turn a blind eye during these months, and allow them to approach shoppers in parking lots and on the street. The rest of the year it’s technically illegal, but I think they understand that people might be more generous this time of year. Several leaders who are involved in kids ministry programs, ours included, report huge growth in attendance too, from kids (and parents) who are hoping that the end of the year Christmas parties will provide a bit of extra gain. It’s exciting to have kids show up that you’ve never seen before, only to have them disappear in January. We can only hope that some seeds are planted in the time they attend. It’s a very hard line to walk, on one hand you can understand the desperation the people are in, but on the other hand, it’s irritating to constantly be on the defense every time you open the car door in public, and are approached by groups of people looking for a handout. Samantha at the mall. I don’t know what else to say about this one. Overall though, the devotion to Christmas is awesome, it’s fun, and everyone wishes you a “Merry Christmas” instead of “Happy Holidays”. All the decorations, music, and goofy “dancing Santas” in the department stores are part of the charm, and we’ve really grown to love it. So Malipayong Pasko, or Maligayang Pasko to you “Northern” Islanders, and Merry Christmas to all of you who are gearing up for Autumn! And yes, I am still going to hang my “Christmas Leaves” soon and nibble on pumpkin-maple-flavored-something. I’m not quite ready to let go of my Fall fix quite yet. Thanksgiving Is Sort Of Here! | Beware the Comfort Zone!